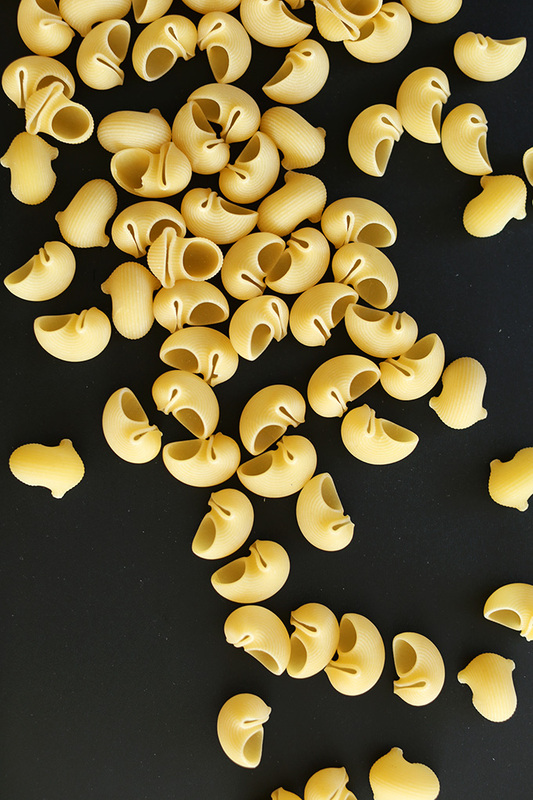 I’m sure we all have horror stories of the mac n cheese of our yesteryear. For me it was almost always boxed, but in the rare chance that it wasn’t, it was certainly made with that processed block of horror known as Velveeta (*shiver). This is not that kind of mac n cheese. This is unprocessed, wholesome, dairy-free goodness for those of us who still crave a bit of our childhood favorites without all the junk. 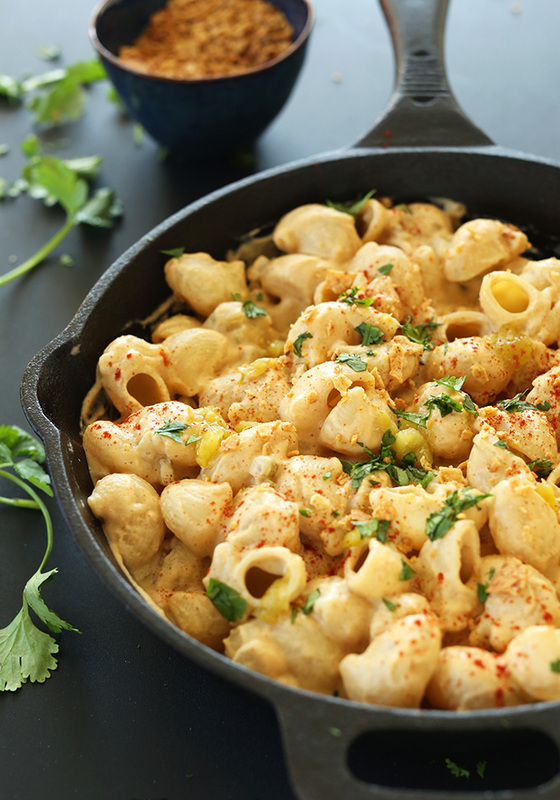 Don’t be intimidated by vegan mac n cheese. I was a little skeptical at first because my initial attempts at cashew sauces were unsuccessful. But I’ve learned a few tricks here and there (how long to soak, how long to blend, what spices/seasonings to add) and I’m now a HUGE fan. 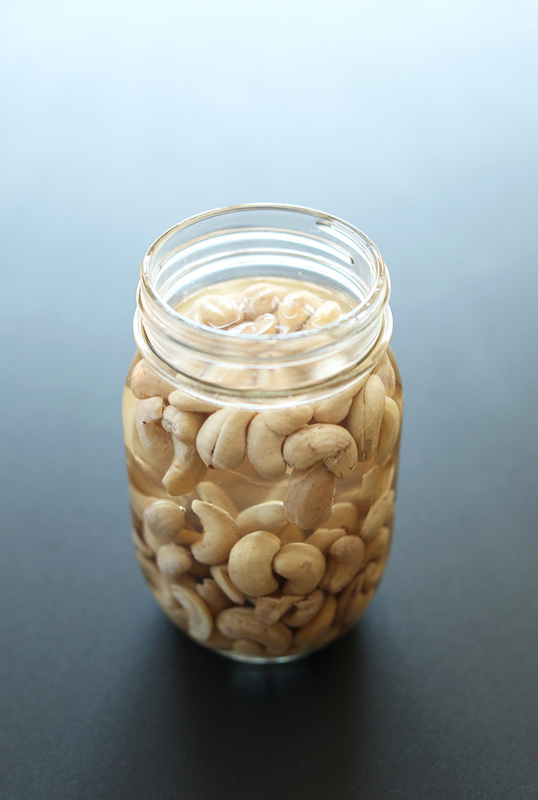 It’s unbelievable how a jar of soaked cashews can turn into rich sauces, luxurious ice creams and bonafide cheesy goodness. Plus, this particular recipe requires just 10 ingredients (minus the tortilla chips) and 30 minutes! It doesn’t get any easier than that. This sauce is infused with plenty of flavor thanks to cumin, chili powder and green chilies. Half of the chilies go into the sauce, while the other half get stirred into the final product. The result is oh-so dreamy. Once you stir the sauce with the noodles and the green chilies, it’s time for a little crunch. I toasted up some tortilla chips until golden brown then sprinkled them on top for another layer of flavor and texture. I was in love. Swoon. Oh, and by the way, each serving has 19 grams of protein! WHAT?!! I personally think you could serve this to a non-vegan and they would totally dig it. 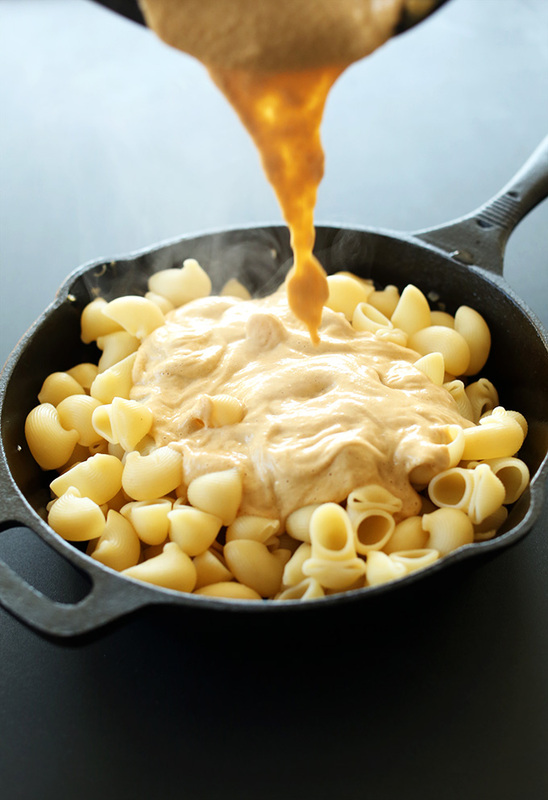 They may be able to tell it’s not “true mac n cheese,” but it’s so creamy and flavorful and satisfying that they’ll have to be won over. 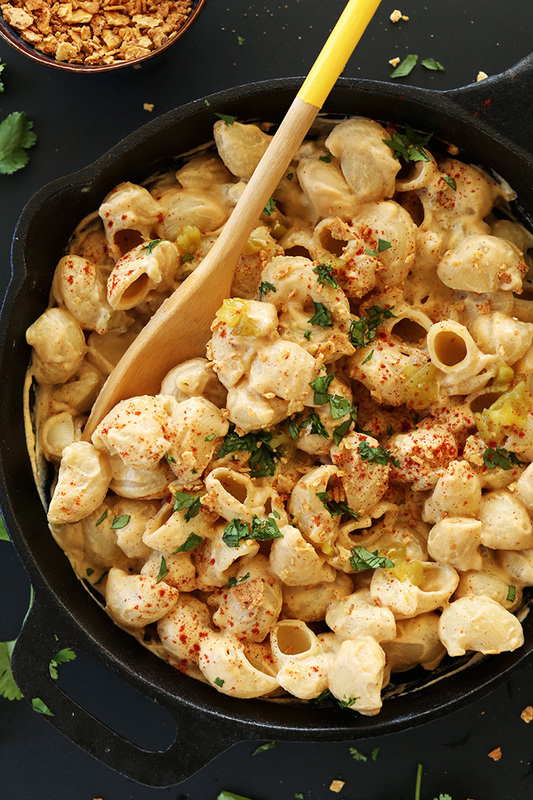 This makes enough for 4, or 3 very generously, so invite a few friends and take them to vegan cheese heaven. Cheers! If topping with tortilla chips, crush chips into fine crumbs and add to a baking pan lined with parchment paper or foil. Spritz with olive or avocado oil, sprinkle with salt and stir. Then bake in a 350-degree F (176 C) oven for 10 minutes or until golden brown. Boil macaroni according to package instructions. In a medium skillet over medium-low heat, sauté onion and garlic in a bit of olive oil. Season with salt and pepper, stir and cook until soft and fragrant – about 7 minutes. Set aside. Add onions and garlic to a blender with remaining ingredients, omitting the tortilla chips and adding only half of the green chilies. Blend until smooth, using the “liquify” setting if you have it to get it really smooth. 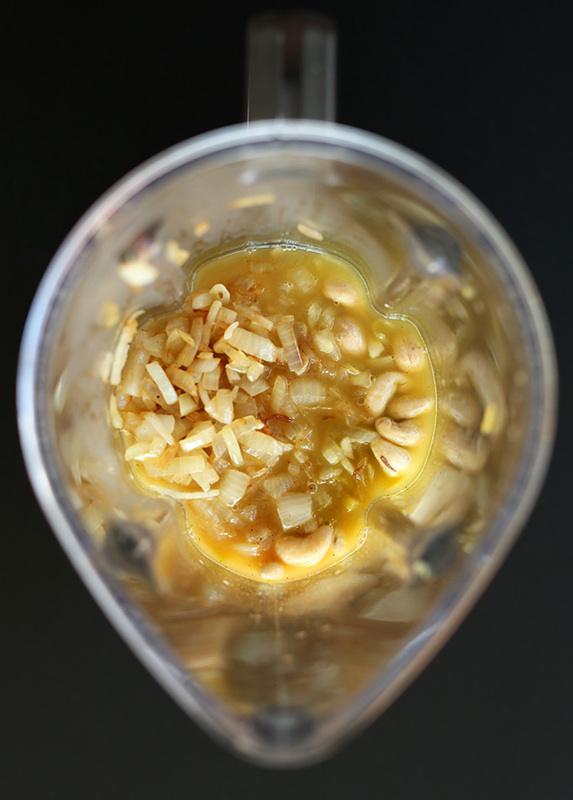 Otherwise just blend for up to a minute, scraping down sides as necessary, until smooth and creamy. Drain the noodles, set aside, and cover (with a towel). To the same pot you boiled the noodles in, add the cashew cheese and cook on low stirring frequently until slightly thickened. Add the macaroni noodles to the cheese, along with the remaining green chilies and stir. Serve immediately, topping with crushed toasted tortilla chips and cilantro (optional). *Adapted from the amazing Isa Chandra. *Nutrition information is a rough estimate calculated without tortilla chips.